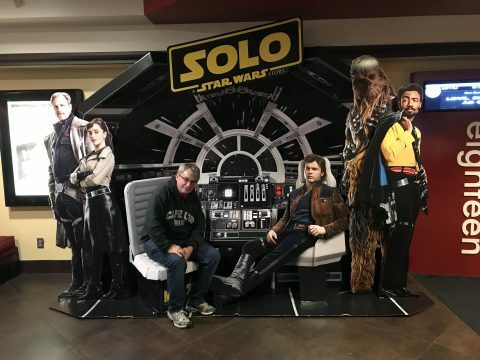 Last Wednesday Tara and I finally got a chance to see Solo, and I came away pretty impressed. It’s not doing very well at the box office for various reasons, but if you have an even modest liking of Star Wars, you need to see it. Solo and Rogue One are the best Star Wars movies since the original trilogy. Solo reminds me about what makes Star Wars great, a movie that is a blast to watch, much like A New Hope and Empire Strikes Back. Tons of humor, a few glimpses of foreshadowing, and above all, no question about who shot first. L3-37 is a great character! Woody Harrelson is about as far away from Boston as you can get and Donald Glover imitates Billy Dee Williams’ voice exactl. It will wash the bad taste out of your mouth left by The Last Jedi (Ugh, spaceships don’t slow down when you remove propulsion) or The Force Awakens (didn’t I already see this in the original trilogy). And no Jar Jar or senate hearings. ← New running shoes day!